Though it's the focus of the program's name, Adult Winter Reading at the Estacada Public Library involves more than books. 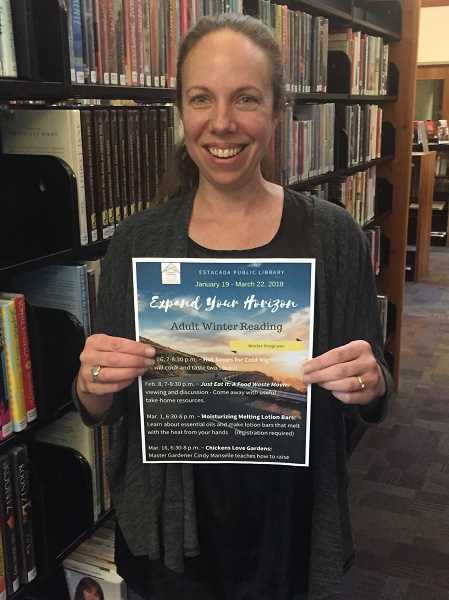 "It's not just about reading," said Adult Services Librarian Leslie Pearson. "If you're not a reader, you can still join. What I loved about the event last year is that it brought people to the library, and not just readers. The program is for anyone in Estacada." The theme of the program, which spans from Friday, Jan. 19, to Thursday, March 22, is "Expand your Horizons." "It's a great theme to jumpstart excitement and discovery," Pearson said. In addition to a reading challenge, several events designed to introduce attendees to new concepts will be featured. These activities include cooking soups, viewing a film about food waste, creating lotion bars and hearing from a master gardener. Participants in the program can pick up a reading log to keep track of the books they read. For every five books read or listened to, they will receive a raffle ticket. Attendees of any of the program's events will also receive a raffle ticket. Additionally, the Adult Winter Reading program will also feature a "challenge bookmark" that will encourage participants to engage in activities and learn something new. Items on the challenge bookmark include watching a foreign film, cooking a meal from another country, reading a book about an immigrant's experience, listening to a CD in a new language and reading a book in which the main character has an experience different than your own. "I hope people end up discovering new thoughts and ideas," Pearson said. "When you open yourself up to new things, you always come away with something meaningful to take home." When discussing the programming scheduled for Adult Winter Reading, Pearson said she was particularly excited about the cooking event. "(Cooking programs) have really expanded what I've felt the library can do. It's not something you'd expect at a library" she said. "We have a really great lineup of programs. There's something for everyone. A lot of people who aren't library regulars come (to the events)." She encouraged anyone interested in particularing in Adult Winter Reading to do so. A sign up packet will be available at the library, 825 N.W. Wade St.
"You might be surprised at how much fun you end up having," she said. "Don't feel intimidated. It's more than just a big list of books." 7-8:30 p.m. Friday, Jan 26. Hot soups for cold nights. Cook and taste two soups. 7-8:30 p.m. Thursday, Feb. 8. "Just Eat It: A Food Waste Movie" viewing and disussion. 6:30-8 p.m. Thursday, March 1. Moisturizing Melting Lotion Bars. Learn about essential oils and make lotion bars that melt with the heat from your hands. Registration is required. 6:30-8 p.m. Friday, March 16. Chickens Love Gardens. Hear from Master Gardener Cindy Manselle.